“Absolutely charming old world style. This book reaches back to the classical Sherlock Holmes story telling but without the unconnectable instances and characters that sometimes enter the pages of the old ones. I feel that this author has successfully taken the much loved story of Sherlock Holmes and Dr. Watson and made it enjoyable for new generations. Being based on fact, this mystery will be a delight for historical fiction fans as well as those that enjoy historical and mystery genres. I don’t normally find this genre to my taste, but enjoyed this story a lot and appreciated the author’s respect for his readers. “Synopsis: The Dean of a Swiss university persuades Sherlock Holmes to investigate the background of a would-be lecturer. To Dr. Watson it seems a very humdrum commission – but who is the mysterious ‘Lieserl’? How does her existence threaten the ambitions of the technical assistant level III in Room 86 at the Federal Patents Office in Berne by the name of Albert Einstein? The assignment plunges Holmes and Watson into unfathomable Serbia to solve one of the intractable mysteries of the 20th Century. In Tim Symonds’ previous detective novels, Sherlock Holmes and the Dead Boer At Scotney Castle and Sherlock Holmes And The Case Of The Bulgarian Codex the author based pivotal historic facts and a principal character on real life. So too in this new mystery. “There is a lot of interest in Sherlock Holmes currently, with the BBC’s television series Sherlock and the American CBS series Elementary drawing a new generation of television viewers into the classic characters of Holmes and Dr. Watson. I have seen a few episodes of both shows and while as entertaining as most any contemporary crime drama, both are set in the current-day and their characters, for those of us who have read the canonical Sir Arthur Conan Doyle detective stories, do little but carry on the names of the Conan Doyle heroes—especially in the American series where so many aspects of the original premise have been radically changed. Thus, when I had a novel sent to me for review for In Serbia that announced itself as a Sherlock Holmes mystery, I did roll my eyes a bit. My first thought actually was “can’t people leave the poor Sherlock and good Dr. Watson to rest already and create their own detectives for television and new books?”. However, my initial concerns were without warrant: unlike these new television shows that rewrite Holmes as a contemporary crime fighter, the novel Sherlock Holmes and the Mystery of Einstein’s Daughter is set in the early twentieth century and places the central characters much closer to the original circumstances that Conan Doyle devised for them in his own work. For me, even as a boy, much of the joy of the Sherlock Holmes mysteries was in the very fact that they were written in another time and set in that time: there was a grand sense of romance, integrity, and courage found in those books in good part because they represented what many consider to have been the apex of the British Empire. Conan Doyle’s characters have doubtlessly inspired many writers who have worked aspects of those characters into new concepts—the character of Dana Scully on the X-Files has been said to have been inspired by Watson, in example, as Scully is also a medical doctor and is skeptical of many of the ideas of her partner, Agent Fox Mulder. That is fine, to see other writers and film-makers thus inspired, but to remove the duo of Holmes and Watson from their original context is to me rather disturbing and also removes much of their real appeal as characters. Thankfully, the author of this novel, Tim Symonds, places his Holmes and Watson in a context that I could fully see Conan Doyle approving of and one that draws the reader into an exciting mystery. What makes the Symonds’ book work is the author’s keen sense of timing and his expansive knowledge of history and period traditions and culture. What makes it both all the more exciting and of especial interest to readers of In Serbia is that it is in good part set in Serbia and follows an intriguing path of clues to Novi Sad. Symonds’ command of historical detail cannot be overstated: The man has been able to gather a wealth of compelling details about everything from restaurants of the period to the spectre of scarlet fever and weaves all of this into the narrative. While the novel is of course fiction, the supporting details when sourced from history are fully accurate and the reader will learn many fascinating things about England, Serbia, and the general state of life at the time just by reading this very engrossing mystery. This factor, for me as a journalist who has written about history and was educated at university in history, is quite spectacular. Very few writers of fiction attend to historical detail with such care. Symonds also is quite careful and attentive to remain faithful to Conan Doyle’s outlook and the traits he provided his key characters. Several of the canonical Conan Doyle Holmes mysteries are even referenced in the book itself and many of the aspects of language and circumstances found in this novel will be familiar to people who have read the original Conan Doyle stories. Symonds also researched Serbia quite well and is adept in bringing to life the pre-war Serbian countryside and aspects of folklore such as the rusalki—the ghostly female water nymphs—are incorporated into the narrative as unique, engaging, plot devices. Symonds’ knowledge of German academia in the early twentieth century also displays either a longstanding association with the same or else research at the very highest level of historiography. Through and through, no stone has been left unturned by the author in his quest to make every detail of the “real world” in this novel—the actual history that bookends it—as authentic and informed as possible. The fruit of this labor is a novel that shimmers with the sheer amount of learning and care for the powerful detail furnished it by its author. As to the plot, the combination of Sherlock Holmes and Einstein at first struck me as a bit reaching, but it really works. Einstein obviously was one of the greatest thinkers and greatest men of the entire century and Holmes has been by tradition written a character on rare par in intellect with the great physicist. Einstein and the characters around him thereby provide the author with a great content of human psychology with which to build a mystery and Serbia is well-rendered in prose here, creating a setting that will seem exotic and compelling to those readers not familiar with it but just as enchanting to those of us who know and love Serbia well. Lieserl, Einstein’s daughter of the book’s title, provides a focus of mystery fitting for the world’s greatest detective: The basis in history for this mystery only makes it seem more vivid, more vital for Holmes to solve and more tangible to the reader. Symonds’ writing is in general fascinating and well-crafted though at points his narrative approach is a bit more old-fashioned than today’s mystery writers such as P.D. James—which is fine, given the historical setting and characters of this book. Indeed, I suspect if written with the terse flow of a modern detective novel this book could fail, but Symonds is perfectly able to capture the spirit and sense of Conan Doyle’s writing and build his own novel in a manner that makes it read nearly as if it came from Conan Doyle’s very own pen. This review was published on the In Serbia website by Mike Walker. Sherlock Holmes and The Mystery of Einstein’s Daughter is available from all good bookstores including Amazon USA, Amazon UK, Waterstones UK, Watson’s Lounge and for free shipping worldwide Book Depository . In ebook format it is in Kobo, Apple iBooks(iPad/iPhone). 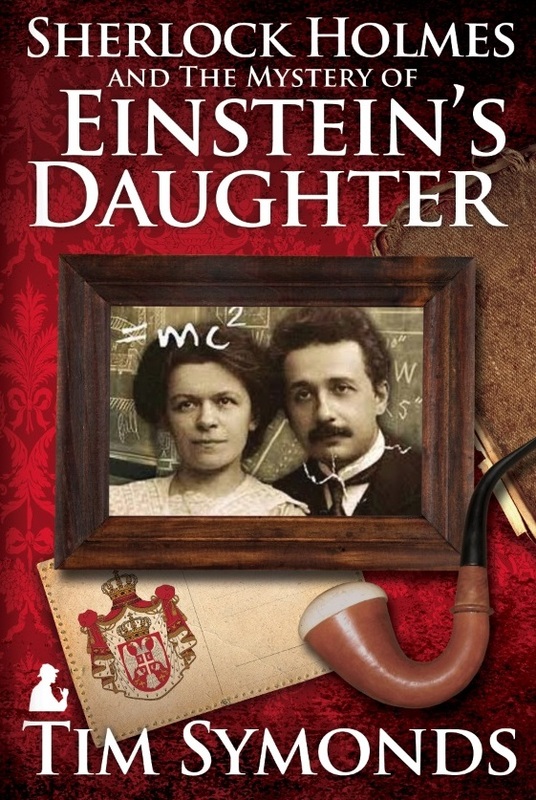 Leading Scientist review’s Sherlock Holmes and The Mystery of Einstein’s Daughter. American scientist Frederic Golden wrote the famous article on Einstein for Time Magazine’s ‘Man of the Century’ edition, at the end of 1999. Who better then to review the new Sherlock Holmes novel that covers the controversial subject of his daughter. Sherlock Holmes and The Mystery of Einstein’s Daughter is available from all good bookstores including Amazon USA, Amazon UK, Waterstones UK, and for free shipping worldwide Book Depository . In ebook format it is in Kobo and Apple iBooks (iPad/iPhone).